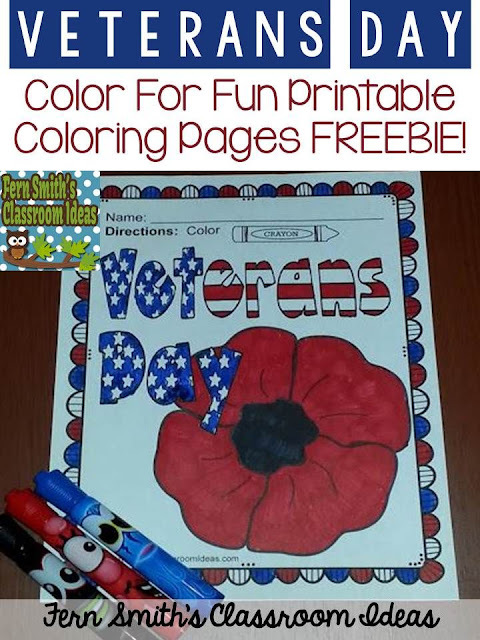 Veterans Day Resources and Freebies - Fern Smith's Classroom Ideas! Friday, November 11th is Veterans Day! Time to begin planning for this special holiday. Many schools will be off on Friday, but many children will not really know why. 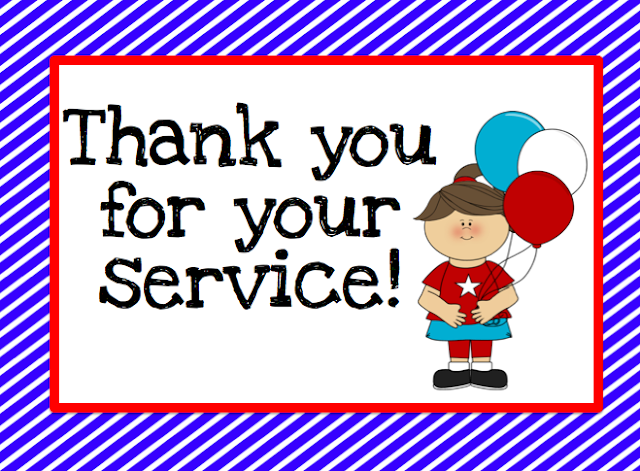 I'm so happy that lately I've been receiving emails from schools all over the United States asking for permission to use my Veterans Day Color for Fun as a thank you note to Veterans. Many schools are coloring them and using them as placemats for a Veterans Day luncheon, high school social studies students are spending an afternoon with kindergartners coloring and writing thank yous to give to the local VFWs....my emails are so wonderful some nights I'm moved to tears reading them to my husband. I am very proud to be the wife of a retired Navy man! As a teacher it was hard to move and start over, but he is so worth it. 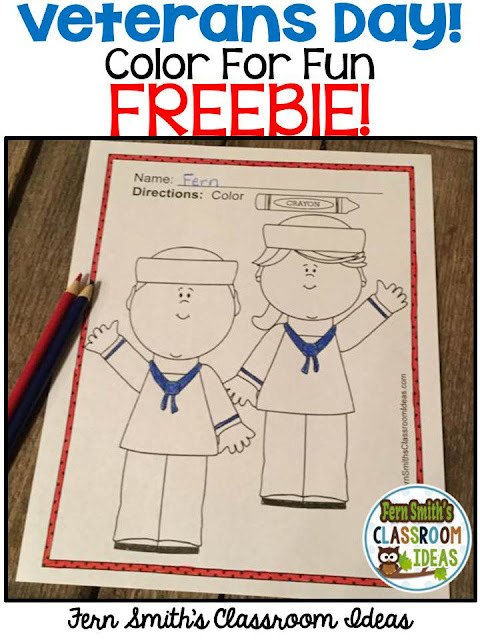 As a thank you for all the retired military who are now teachers and for their wives and family, every year we like to offer a Forever Freebie for everyone to use in their classrooms as a way to teach the next generation about Veterans Day and Memorial Day. 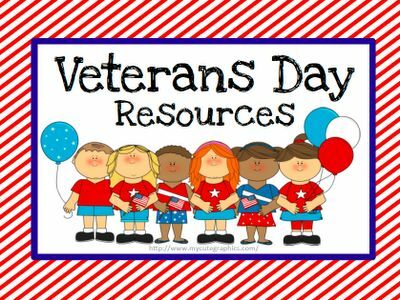 My friend, Michelle at Teach123, has a free Readers Theater for you about Veterans Day. 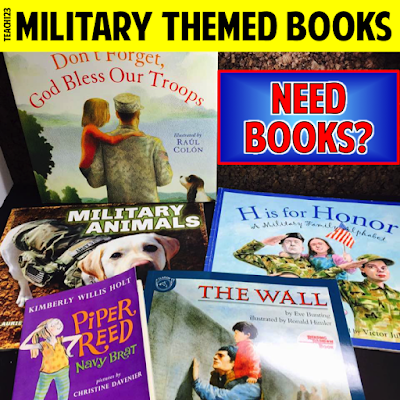 She is also giving away some Military Themed Books to one lucky teacher. 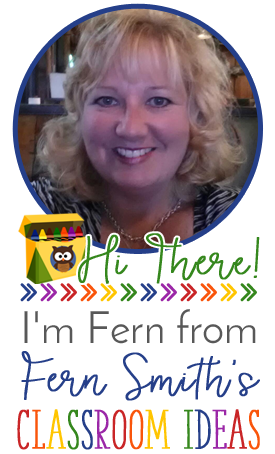 Click here to visit her blog for more information! Good luck! 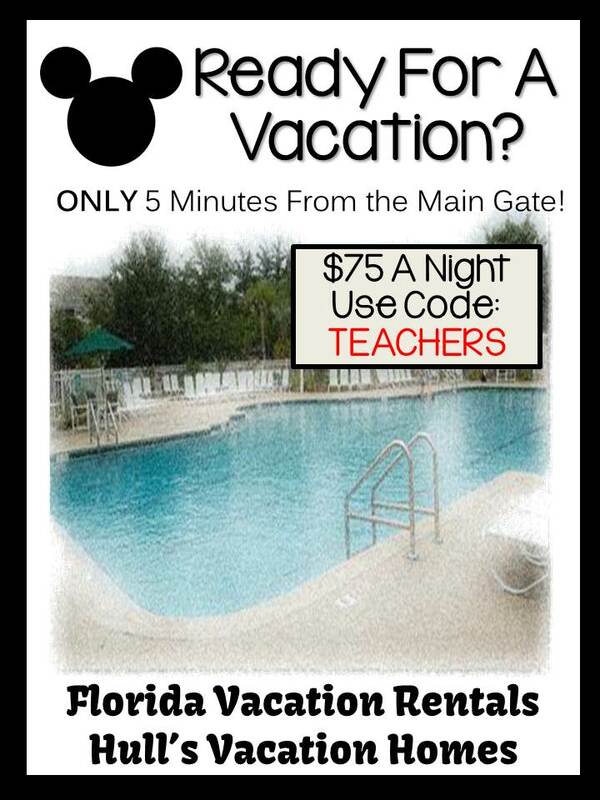 I know your days are full with reading, writing, math, testing, testing, testing and did I remember to mention testing? 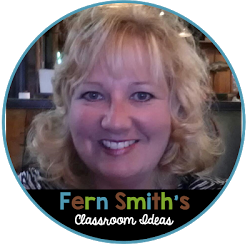 Here are a few of my freebies to help you incorporate a little social studies into your math and literacy centers. If you take any pictures, I would love to see them. 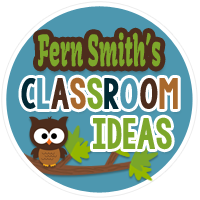 You can email me at FernleySmith@gmail.com or hashag me with #FernSmithsClassroomIdeas on IG! with 21 pages and all branches of the military! If you are an intermediate grade, these are also terrific to use as story starters and writing prompts. 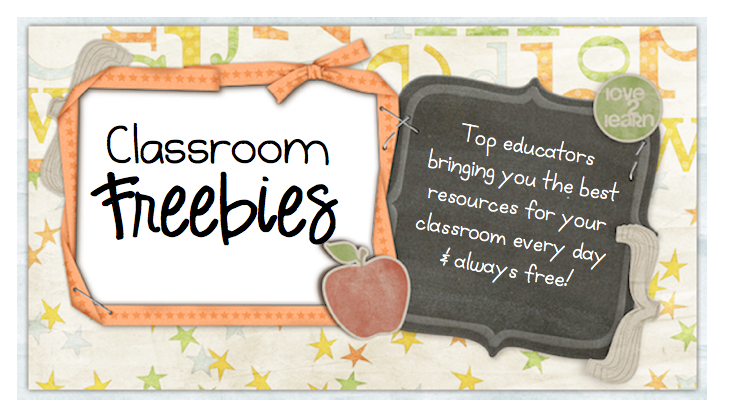 Click here or on the pictures to download this freebie from TPT. Scroll down and click on the pictures to see my previous three years! Click on the picture below to go to my Veterans Day Resources Pinterest Board. I would ♥love it if you would like to follow it too! 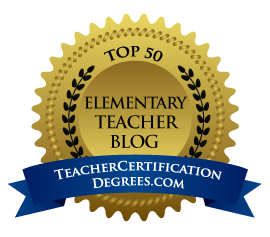 Click here if you are reading by email or Blog Lovin'. 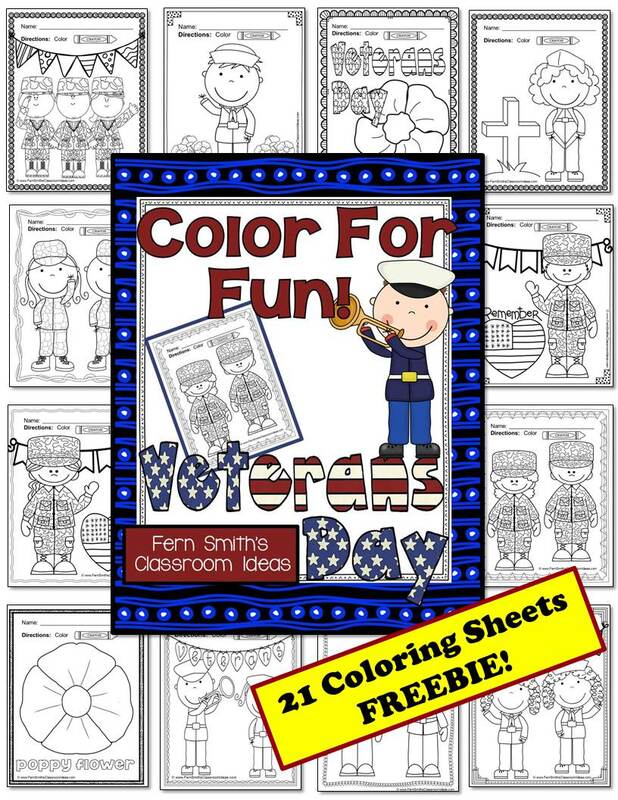 Have You Seen My Christmas Coloring Pages?